“SEB offers good and globally diversified service across regions as well as asset classes. 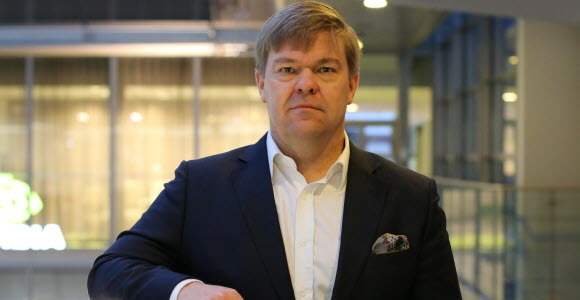 Our partnership with SEB works well for our portfolio managers as well as for our administrative staff,” says Mikko Mursula, Chief Investment Officer of the Finnish mutual pension insurance company Ilmarinen, which in terms of assets under management is one of the 20 largest in Europe. Ilmarinen, which takes its name from The Kalevala, a Finnish work of epic poetry, merged last year with the smaller mutual company Etera. Ilmarinen is part of Finland’s obligatory occupational pensions market and is responsible for pensions (deposits and disbursements) for some 1.1 million people in Finland. Assets under management amount to slightly more than EUR 45 bn (just over SEK 420 bn). Mikko Mursula is in charge of more than 100 people in the asset management operations, broken down into front and back office staff. Many of them are in regular and frequent contact with SEB, which is one of the pension company’s most important business partners. “When I talk with our key people and their cooperation with SEB, I always see a few recurring common denominators,” he says. “Among these are the good personal relationships and strong local presence here in Finland and the rest of the Nordic countries. That facilitates our cooperation. SEB also receives high marks for its experienced and competent equities analysis team. The bank is also regarded as a leader in sustainability. “SEB was one of the first to include sustainability aspects in its equity management,” says Mikko.